At the airport in Kahului, a young California couple was telling me how impressed they were with Maui’s lack of environmental problems and thought that California could learn something from us. They had been here for a week. So I had to say something. Maui may look beautiful on the surface, but we have plenty of environmental concerns. “Then there’s Monsanto.” Maui and parts of Hawaii are a hotspot for the testing of GMOs, genetically modified organisms, also known as GE organisms, genetically engineered organisms. 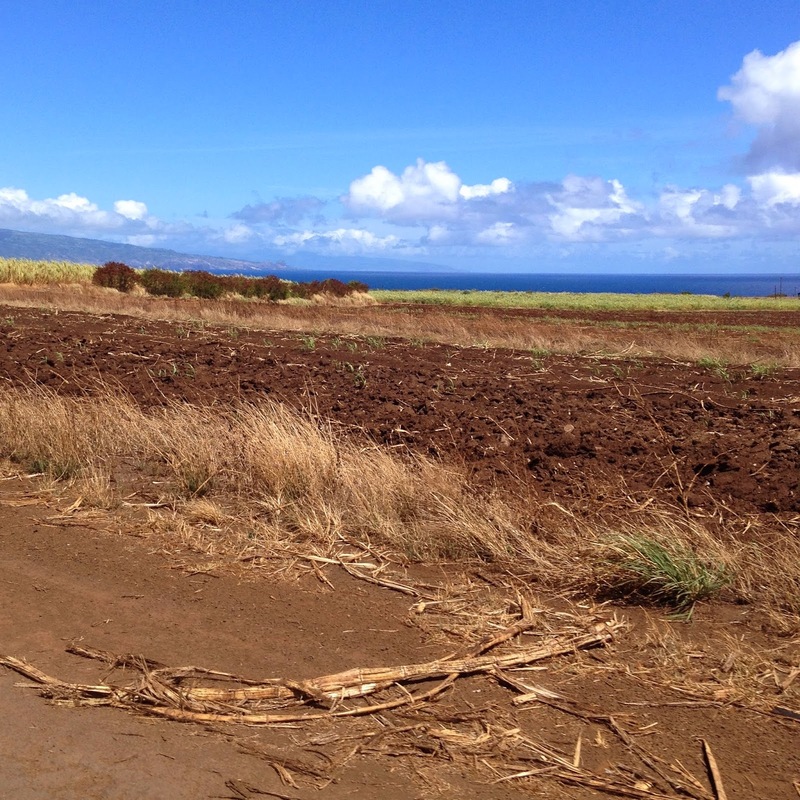 In Maui’s lovely climate, three seasons of GMO corn can be grown a year and we’re not sure what the environmental and health consequences are from the chemical drift from the fields or from GMO pollen in the air or other effects from this kind of open field testing. It’s a big, hairy issue that has upset a lot of people. Read this article for more background on the GE controversy in Hawaii. 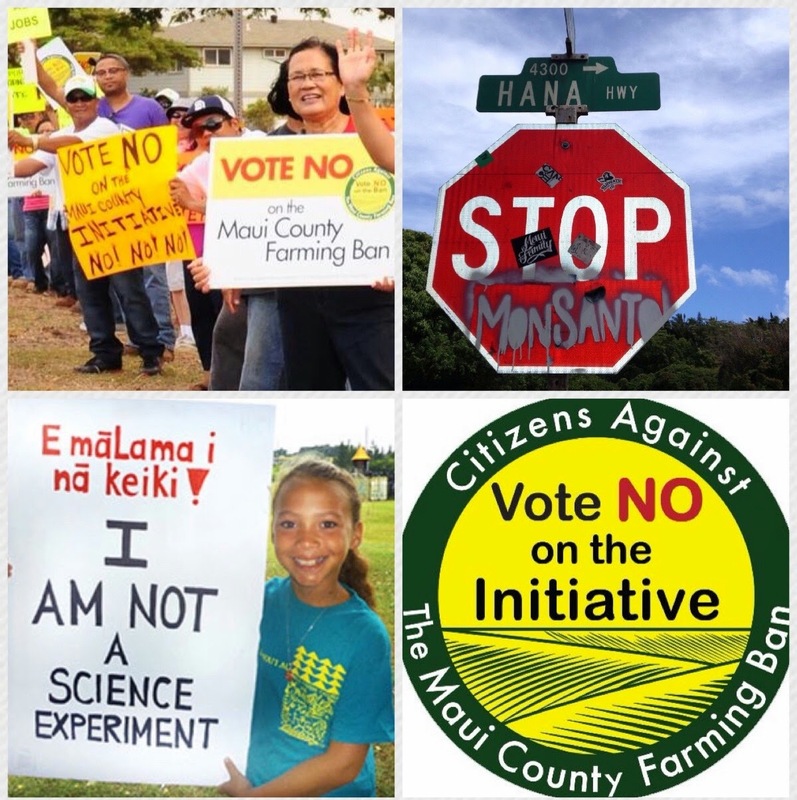 Various photos of the GMO controversy: from the Maui County Farming Ban Facebook Page, the Shaka Movement site, and a pic of a Stop Monsanto stop sign I took. GMOs have been such a hot topic on Maui that thinking about them makes me kind of wince. I know people on both sides of the controversy, people who are vehemently opposed to Monsanto’s presence in Hawaii, and people who directly or indirectly benefit from Monsanto’s money. For years, some Maui residents have pushed for the labeling of genetically engineered food, so that people can decide for themselves what to eat if they know what’s in the food. Several attempts to pass a GE labeling bill have failed. Opponents say GE labeling would hurt the food industry. The latest GMO battle is happening now, in the final days before the November election. It’s historic. The first ever citizen’s initiative is on Maui’s election ballot. Approximately 20,000 signatures were collected, requiring that the public vote on whether or not to enact a GMO moratorium. This moratorium would affect three islands in Maui County: Maui, Molokai and Lanai. The stakes are incredibly high. Monsanto pours a lot of money into Hawaii’s coffers. There is a lot of propaganda and rallying, and Facebook activity pro and con on this issue. There are TV commercials and radio ads, youtube videos, and telephone surveys. There are rallies and marches and concerts and fundraisers. 1. Hatred and fear. This kind of propaganda and anger stirs up a lot of deep feelings and self-righteousness, name calling. Fear is running strong on both sides. Fear of losing, fear of survival, fear of speaking up. 2. Mistruth. The media spin is calling it a ban against farming in Maui County. It’s a temporary ban on GE testing, which could be recalled by a 2/3 vote by the Maui County Council. 3. Silence and repercussions. I personally know a lot of small farmers who would be very outspoken against GMOs, but have been told clearly that if they speak out, their organizations will lose County funding. Core issues going on at the heart of the GMO debate. The most predictable thing about controversial environmental issues is that the debate rhetoric is the same: pitting “jobs” vs. “the environment.” As if they are mutually exclusive. How about a world in which jobs and environment can be said in the same breath, and be on the same side? It doesn’t have to be one or the other, but the debate is framed that way, over and over again. If we could take away fear of survival, how would people vote or act? It’s very hard to vote against one’s self-interest or one’s paycheck. If you’ve ever quit a job to step into the unknown, you know what I mean. It’s also very hard to speak up if one’s funding is on the line. You can’t expect anyone to act rationally or thoughtfully if survival is at stake. You also don’t get any good solutions when people are in this much fear. If we could take away the hatred, how would people act? Monsanto, whether they know it or not, is actively hated on this island and elsewhere for past and present actions. There may also be hatred towards anyone who is believed to threaten the local economy or jobs. If we could convert hatred to energy, we could power the island. 1. Environmentalists are often accused of not thinking of the short term: the immediate effect on jobs or the economy. The changes in policy can seem drastic. If there is a solid, believable plan for immediate job relief or economic assistance, a safety net, during a proposed policy change, people will have less fear. Much easier said than done. 2. Put workers and managers from Monsanto, environmentalists, farmers, and county officials in Outward Bound programs together. They will not be allowed to talk about politics or religion but have to overcome obstacles and physical challenges together. There was a program that put Israeli and Palestinian children in summer camp. At the beginning of the camp, the kids hated each other, but over time, they started to get along, and by the end of the program, they were friends. In the short term, Outward Bound for adults won’t cause a lot of immediate change, but in the long run, people will be able to talk to each other better, because they will have experienced being on the same side. 3. Monsanto could change its reputation. Monsanto has a besmirched reputation which you can google. It could do something beneficial for the environment and provide jobs, like restoring damaged cropland or cleaning up superfund sites. Monsanto has a lot of brainpower and technology, which could be channeled to large scale agricultural remediation and regeneration, i.e., agriculture that improves the soil and environment. 4. Environmentalists, in a concerted and strategic way, could buy stock in Monsanto to influence how this company makes money. Individual investors who dislike Monsanto’s corporate policy would not be recommended to buy stock, unless participating in a venture that pools money from environmental investors to create corporate change. Is there anything that Monsanto, county officials, and environmental advocates can agree on? I don’t think anyone wants to stop farming or put farmers out of business. I think everyone wants there to be enough food for people. I think everyone wants people to have jobs and a healthy economy. How to get there is where the disagreement is. In a way, I’m glad not to be on Maui right now while the debate is raging. No matter who “wins,” there are going to be consequences and more questions. The resentment around this issue is not going to go away until people really feel like they can talk to each other and the current debate isn’t allowing for that. I’d like to be able to say to the California couple a few years from now, that Maui has found its own path to economic growth that is aligned with the environment, that it is doing long term, intelligent planning. A Maui with vibrant local farming which provides jobs and has unique agricultural products. The question is, do you have to completely start from fresh, or can you have a gradual shift emerging out of the old world? 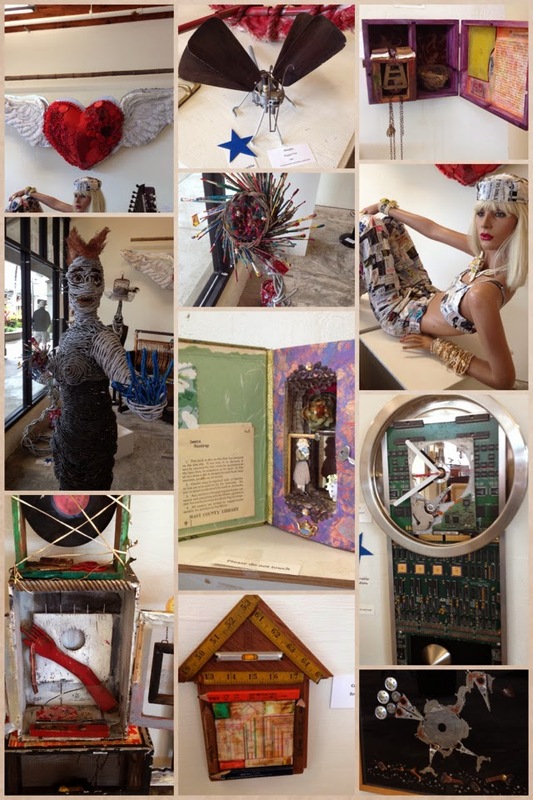 Made in Maui County Festival, this Saturday, November 8th. First ever event to promote products made on Maui (and Molokai and Lanai). Maui is so relaxed and rural, it seems that nothing really bad could happen here. And while we complain regularly about traffic, it’s nothing compared to anywhere else. Excluding the Road to Hana, which has scores of one-lane bridges and more curves than the Swimsuit edition of Sports Illustrated. Photo by Corinne Bourgoin on MauiWatch. 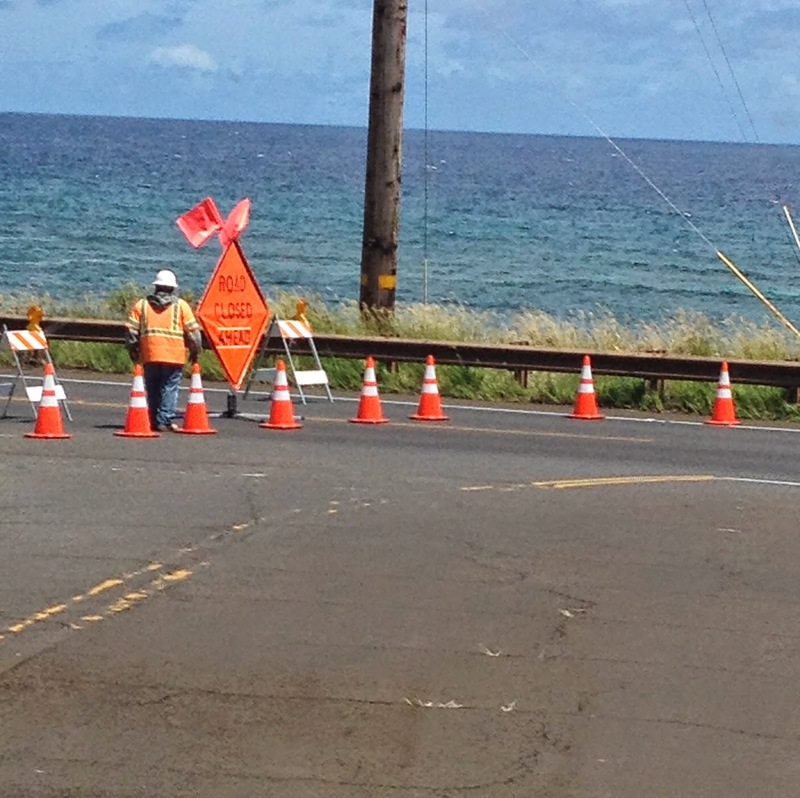 DH and I are driving down Hana Highway towards Paia this morning, around 10:30 am, and suddenly come across a road block, just past Hookipa Beach Park. WTF??? Both lanes are closed and there’s a detour up Holomua Road, that goes into the sugar cane fields and leads to the old Maui High School. Both lanes of Hana Highway are blocked! This is the view coming back down Holomua Road to Hana Highway, on our way back. Even though we have last century’s TV at home, complete w/ rabbit ears and fuzzy snow, I am armed with mobile technology. 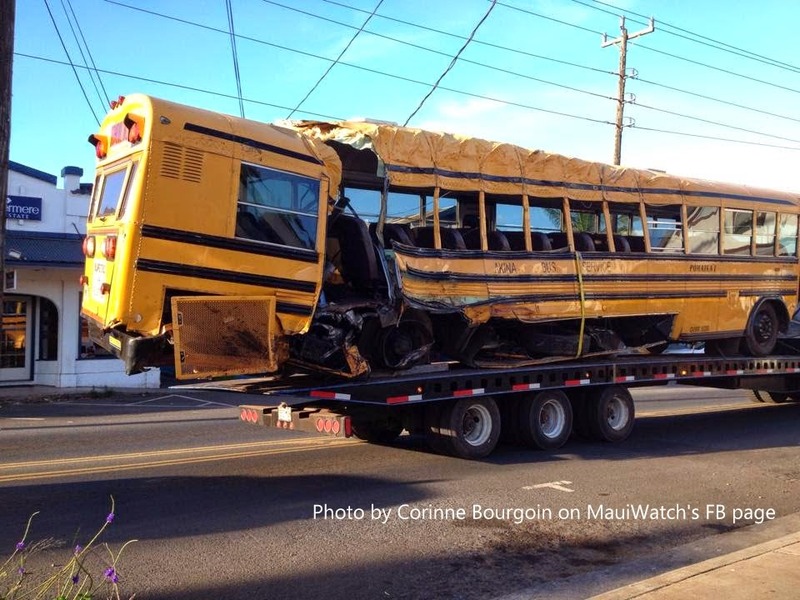 The Facebook page for MauiWatch, which gives Maui residents the latest accident and traffic news plus other breaking news, says there is a BIG accident with a school bus last night. Someone stole an Akina school bus and crashed it outside the entrance to Mama’s Fish House restaurant, walked away from the crash and tried to hitchhike! WTF?? This accident also explains why the power went out in the middle of the night. How the heck are we going to get to Paia? It turns out, there are roads that wind through the cane fields and hit Baldwin Avenue. I am using my map app on the iphone and see a cross road called Lower Hamakuapoko Road, but there is a big yellow gate across it. We drive a little further, wondering if we have to go all the way to Makawao (7 miles out of the way) and a truck and car shoot past us. Hey, they must know where they are going! Besides, it’s an island, so how lost can we get? Somewhere in the deep boonies of the sugar cane fields above Paia. We follow the truck and car and take the next right going towards Paia. It’s a windy road, but it’s paved, but there are sneaky vicious attack potholes (VAPs) that are ready to pounce on lazy drivers. DH manages to avoid most of the VAPs and we follow the curves, hoping not to lose sight of the car in front, then we turn right and voila! We are on Baldwin Avenue, heading down the hill to Paia. Good old Baldwin Avenue, I could kiss thee! Down we go, and WTF!? 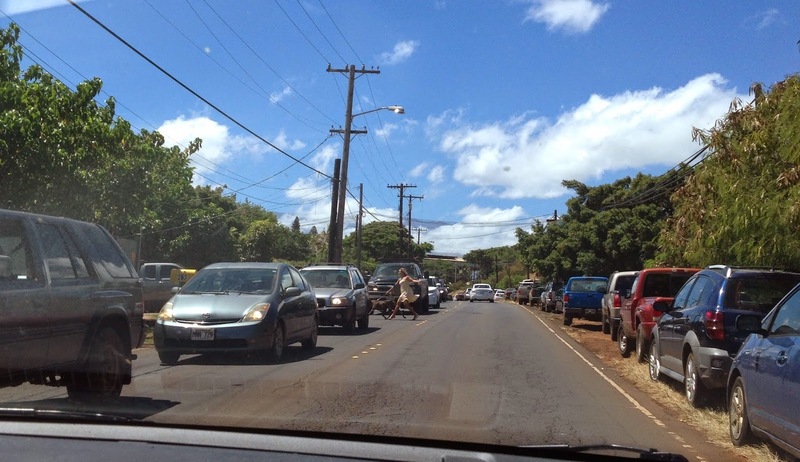 There is a line up of cars going all the way down to Paia. We wait for 10 minutes in traffic, move about 10 feeet, and then decide that the powers that be do not want us in Paia, so we go home. about a mile up the hill from Paia town) is bumper to bumper with cars coming down through the accident bypass. We are heading back home, to Haiku. The full story of the crazy school bus snatcher? Beats me. From what I gather on Facebook, he stole the bus last night, passed another car on a double yellow line, was being pulled over by police, and then took off again and flipped the bus over outside Mama’s. Some commenters said the driver tried to hitchhike and then ran off into the cane fields. "The driver of the bus stay hitch hiking on baldwin and olomoa street. Brown shirt "hawaiis finest" on the front and black shorts." But I kinda have PTSD (post traumatic stress disorder) around the area near Mama’s Fish House. 8 years ago, I had a bad accident around that bend. I had my little rusty Maui cruiser (what we call a beat up car on Maui, a lemon that runs). After I pass Mama’s this minivan coming towards me, suddenly turns left in front of me towards Mama’s back parking lot. WTF!? I brake, but hit the van in the middle. My airbag goes off and punches me in the chest. I am in shock that this dude out of nowhere decides to turn left in front of me. What was he thinking? Why would he think he had room to do this? Police come to the scene and say my car is totaled. My husband shows up, and jumps up and down the hood of the car because it is folded in half like an upside down V, like the crease on an origami paper bird. He manages to jump on the hood enough to make it flat, but it’s like an aluminum ball that you try to straighten out but it’s still crumpled and crappy looking. 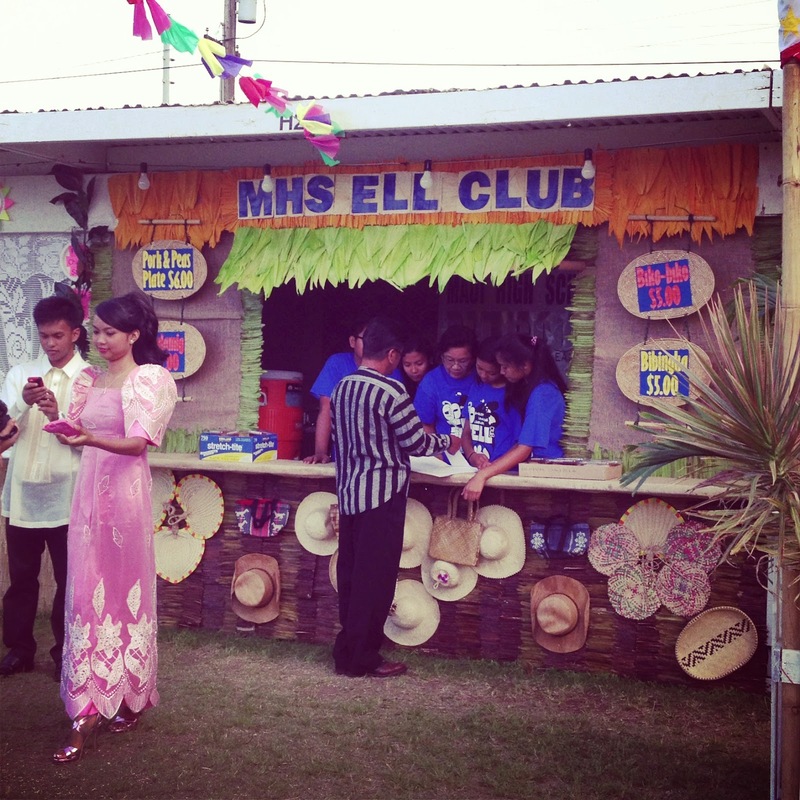 We exchange insurance cards with the other driver, who is from somewhere in Micronesia and works at Mama’s Fish House. Later, it turns out that the other driver had a fake insurance card! Hawaii is a no-fault state for car insurance, meaning one’s insurance covers owns own personal injuries. I didn’t seem badly injured, just sore, but we didn’t know yet. And the driver at fault is the one whose insurance pays for car damage. But this guy’s insurance was invalid. This is actually a pretty common in Hawaii. People get insurance, then cancel it, and keep their insurance card. Called the police officer who was on our case, and he was totally useless and said they won’t pursue it. By the way, Maui police are a mixed bag. For accidents, they don’t seem to be very helpful at all. Another friend got into a car accident in Haiku 8 years ago and the other driver had no license, no insurance and the police did nothing. On the other hand, we have the infamous officer Taguma who loves to give tickets for speeding and we don’t have tons of cops on the road, so that can sometimes be pleasant. DH claims that Maui’s police force numbers compared to population size is about 10% of the national average. That could be changing with the supersize police station in Kihei. Ah Maui! The Hana Highway is now open, at least as of 2 pm, and traffic is flowing slowly according to the folks at Mama’s Fish House. But it’s a dangerous section of the highway. One Facebook commenter writes, “I lived on that corner for a little over a year and saw a lot of spaghetti I hope all are well.” Us too, because it’s a lot of excitement for a little island. 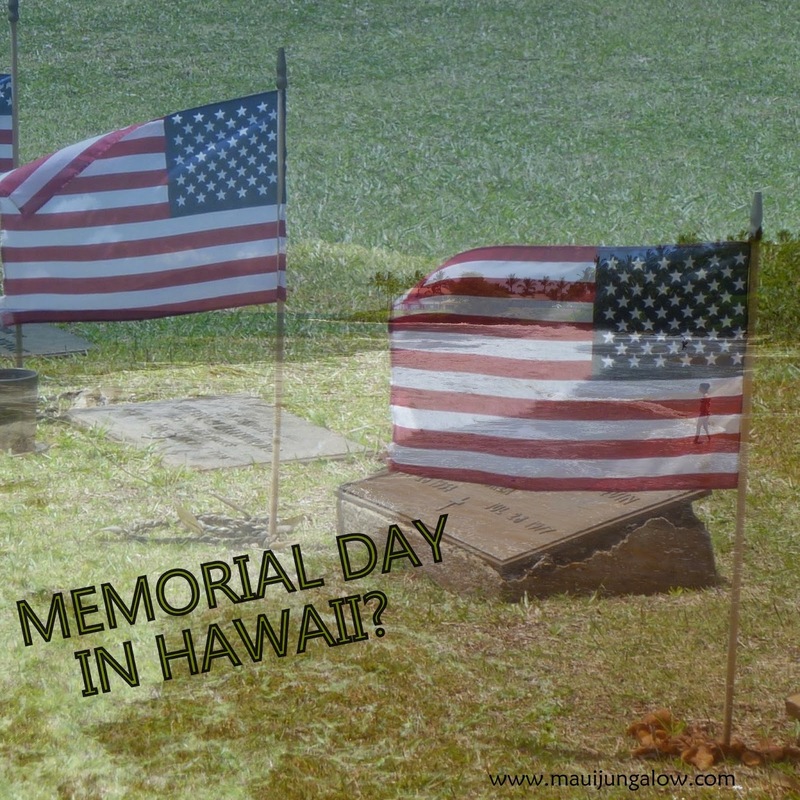 For more info, visit the MauiWatch page. Kind of wish I had checked it this morning! Big shout out to MauiWatch! Did you enjoy reading this post? If so, sign up for my laid-back newsletter (currently about 1x/month) of blog posts and information. Haiku is always full of surprises: hippies, secret pot farms, kombucha cafes, hidden hobbit houses. 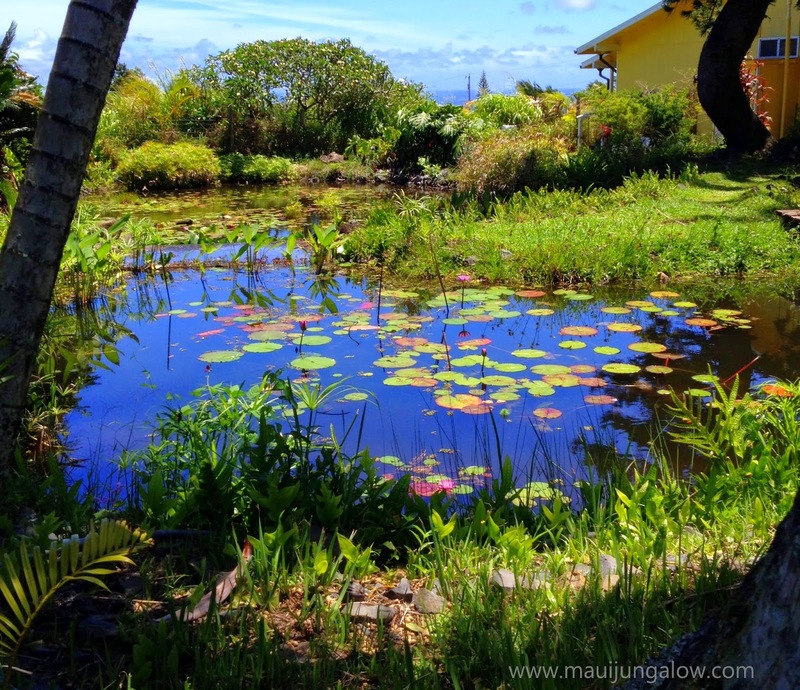 There’s a water lily farm off of Hana Highway, about 15 miles from Kahului called the Maui Water Lily Farm. While there is a noticeable sign on the highway, most people in a hurry will miss it. And it’s worth taking some time to savor. Sometimes they are open, sometimes they are not. The sign at the driveway will let you know. Hours: It depends. Call them if you're driving from far away! Ever have someone make a fresh flower bouquet on demand? I felt like a fairy princess as Nico waded knee-deep through the water lilyponds to cut five fresh water lily blossoms. He carefully placed them into a plastic specialty bag and gently tied them. He cautioned me that they would only last for a couple of days, maybe 3 at most, and that they go to bed at night. 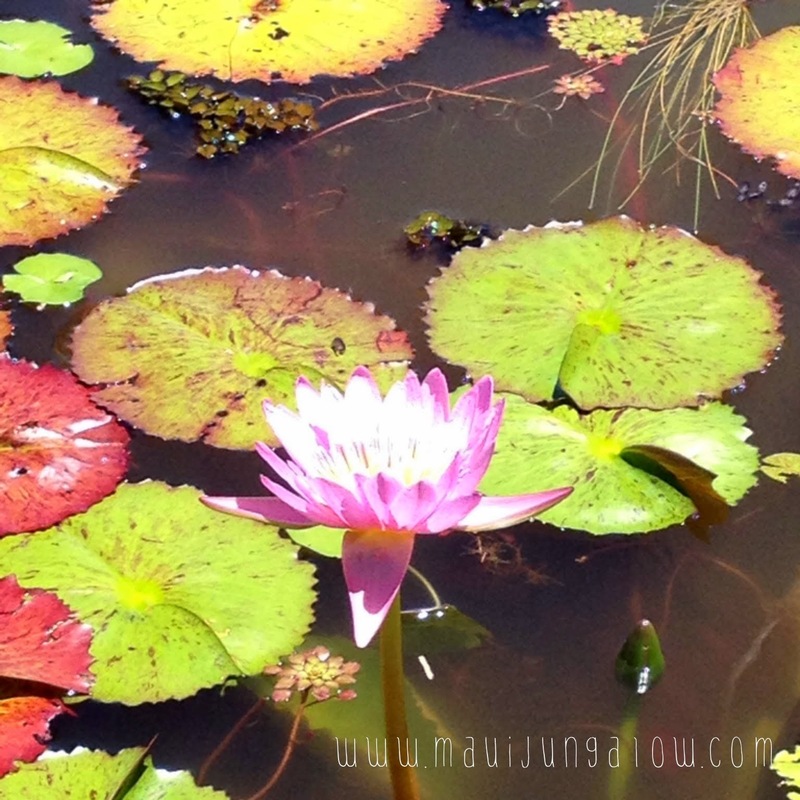 One of the water lily ponds at the Maui Water Lily Farm. 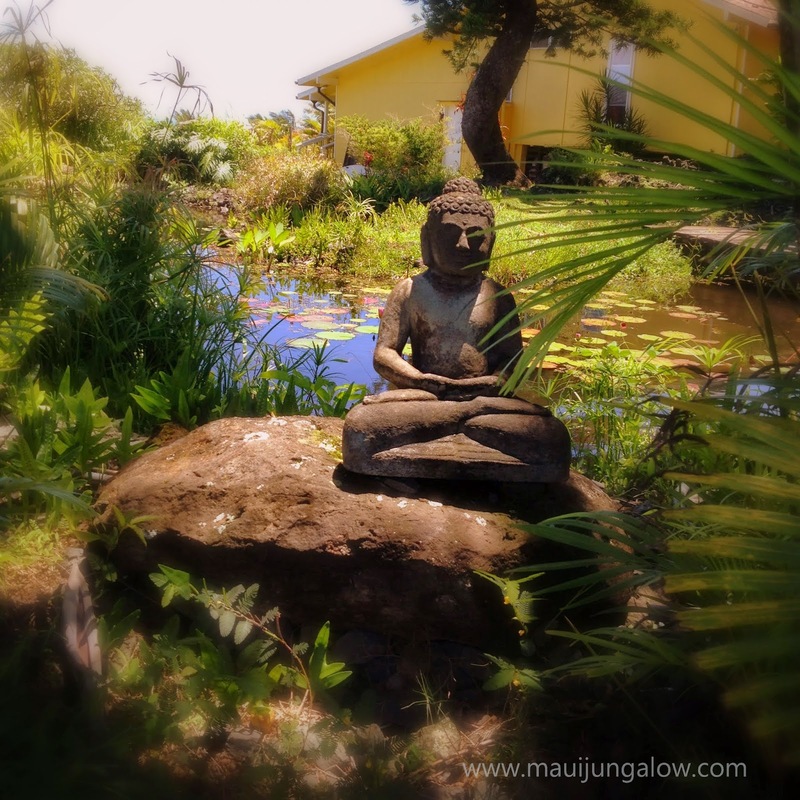 Buddha overlooking the water lily pond. What’s special about water lilies? They are actually fragrant, a soft and not overwhelming scent. They close their petals at night and open up in the morning. The flowers are phototropic: they move towards the light, bending and stretching. Even when the flowers stop blooming, they close up as buds and still look beautiful. These water lilies kept moving towards the light! Haiku Water Lily Farm has two main ponds, filled with water lily plants. 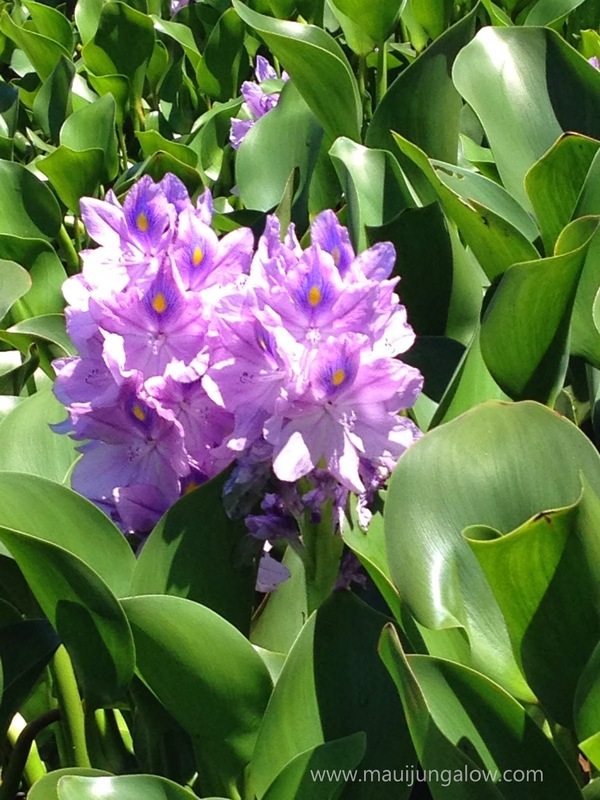 When I stopped by, in late May, there was another unexpected surprise: the water hyacinths were blooming. There were masses of these beautiful lilac blooms along the sides of the pond. Nico said they bloom for a couple of weeks every spring. Mo'okiha O Pi'ilani Launch 2014, July 11th, today at noon, Lahaina – This Maui canoe has been restored to perfection and is being returned to Maui waters. Summer Bash for Education, July 12th, Saturday, 6-8 pm, Kihei. Donate school supplies, win door prizes, watch live entertainment including the Burn n Love Elvis impersonator. Zippy’s is one of the most essential retail places in Hawaii, especially on Oahu. It’s a restaurant, the local equivalent of Denny’s with a sit down restaurant and booths, a bakery called Napoleon’s Bakery, and a take-out area. Unlike Denny’s, Zippy's features local dishes, like loco moco (2 scoops of rice, hamburger patty, lots of gravy and a fried egg) or teriyaki chicken or chicken katsu or…But, I recently ate at Denny's as an experiment and they did have a few local items. 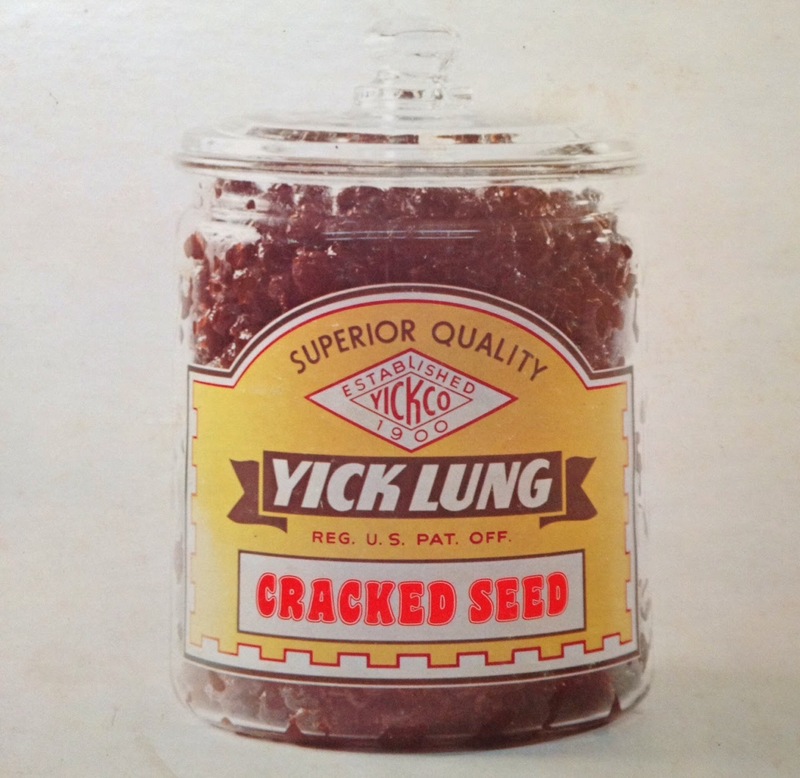 Yick Lung was a local company that made crack seed, a type of preserved fruit snack that is very popular in Hawaii. The Chinese immigrants brought crack seed with them when they came to Hawaii to work in sugar cane and pineapple plantations, but it became a treat that spilled over into the rest of Hawaii. Yick Lung used to be sold in all the grocery stores but sadly, Yick Lung is no more. a great idea which I saw on Tasty Island Hawaii since it's hard to find any pictures of Yick Lung these days. This is a photo I took. 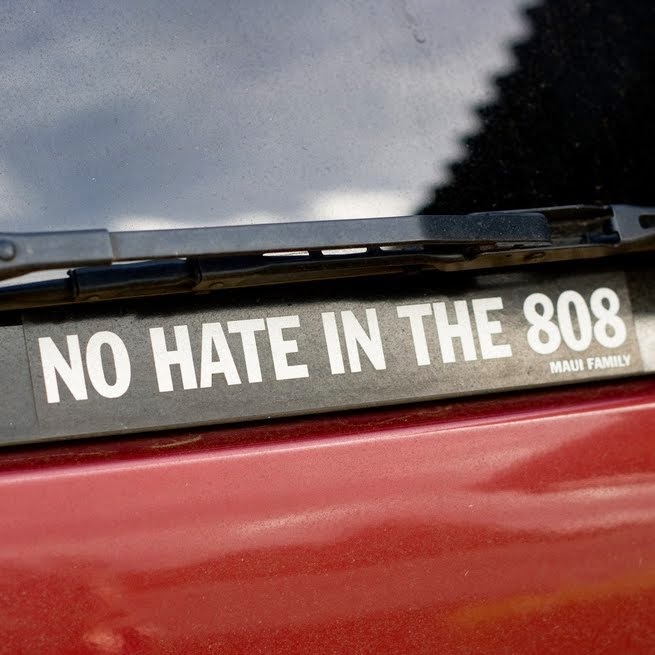 No hate in the 808. This is a bumper sticker you might see driving in Hawaii. Photo by Drazz on Flickr via Photopin. Creative Commons. The 808 refers to the area code for the state of Hawaii. No hate in Hawaii. That’s how we’d like to live, with aloha. But sometimes there is hatred or racism, though it may show up differently than one might expect. 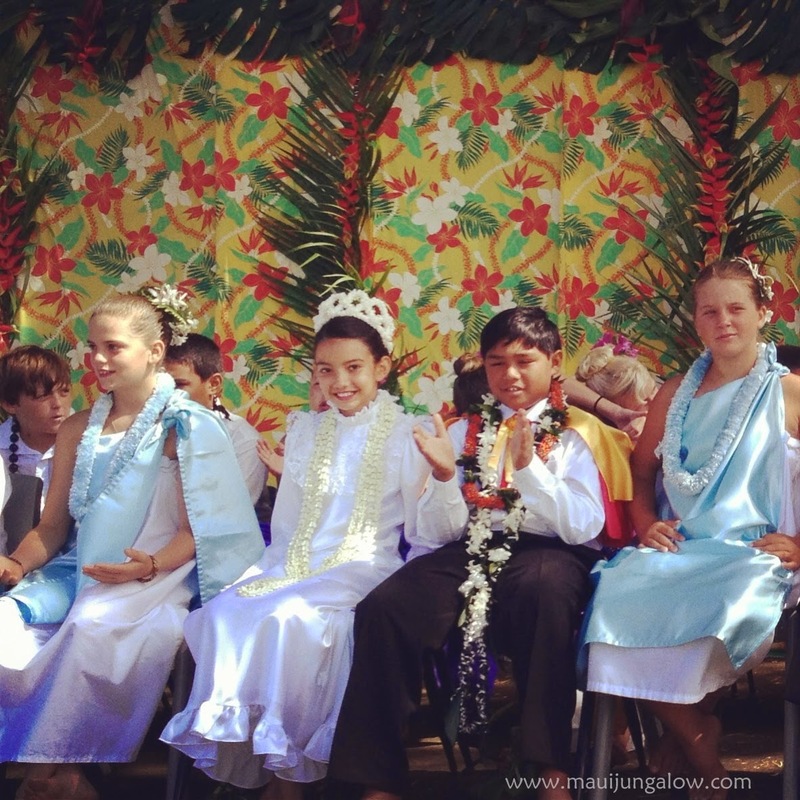 Hawaii is a place of many different cultures and ethnicities. People were brought to Hawaii from different countries to work in the pineapple and sugar cane plantations. They had to work together and get along with each other. Many people intermarried and had children of mixed races and multiple ethnicities. In Hawaii, one is proud of one’s heritage. It’s not uncommon for someone to hold up fingers naming each country or land her ancestors came from: Germany, Portugal, Italy, Japan, China, the Philippines, Samoa, Puerto Rico... So mostly, people are accepted for their differences. But, there is a bit of reverse racism that exists here. It’s mostly under the surface and is mostly directed to people of Caucasian origin, aka haoles. Caucasians are a minority in Hawaii, like all the other ethnic groups. How might reverse discrimination occur? Say you're applying for a job and you're new to Hawaii. Your last name is Smith or Jones. You're Caucasian. You're applying against people with last names like Sakamoto and Perreira and Wong. Chances are, you may not even be called for a job interview, because you have a haole last name. Also, the hiring staff is afraid that if you're new to Hawaii, you may not stay very long - and there is truth in that. Why is there sometimes racism towards white people? Because some people who grew up here have prejudices against the white people who helped overthrow the Hawaiian monarchy and believe that white people brought a lot of bad things to Hawaii. Some people are angry that the price of land is going up and it’s more expensive to live here. Some people are resentful that they are working two or three jobs to support themselves while rich people move here and buy up houses. (and still haven't blended in with the local culture). Often people grow out of their prejudices as they get older. Schoolchildren can be the meanest. I’ve heard stories about local children on the Big Island who pick on the new haole kid who also happens to have blonde hair and blue eyes. Is this xenophobia? Yes. The new kid may have picked a fight but it could also be racism. I’ve heard stories of a friend’s haole daughter who got beaten up badly by a bunch of local girls. It was never reported in the paper or on the news because it was an incident involving minors. These kinds of incidents are rarely reported. Maybe the Caucasian kid played a part too and provoked the other children by making fun of them or doing something that hit a nerve. Still yet, racism and prejudice are often at work here. Even certain neighborhoods, especially on Oahu, are not really safe for the wandering tourist or haole. All you need is a bunch of young local thugs who had a lot to drink and are angry at the world and are just looking for trouble. That’s why certain campgrounds and state parks can be dangerous for tourists to camp in. 99% of the population tries to “practice aloha” but the other 1% has anger management issues. A tourist to Hawaii would probably never encounter any racism or prejudice, except under very RARE circumstances. Mostly Hawaii is very safe too, with little crime. Most people in Hawaii are kind and gentle, and go out of their way to help strangers. They even drive super nice (sometimes annoyingly so). Another Maui bumper sticker, "Practice Aloha." But don’t be stupid. Don’t provoke fights. Don’t get drunk and talk stupid. Don’t call people names. Don’t be anywhere near where angry young men are gathering. 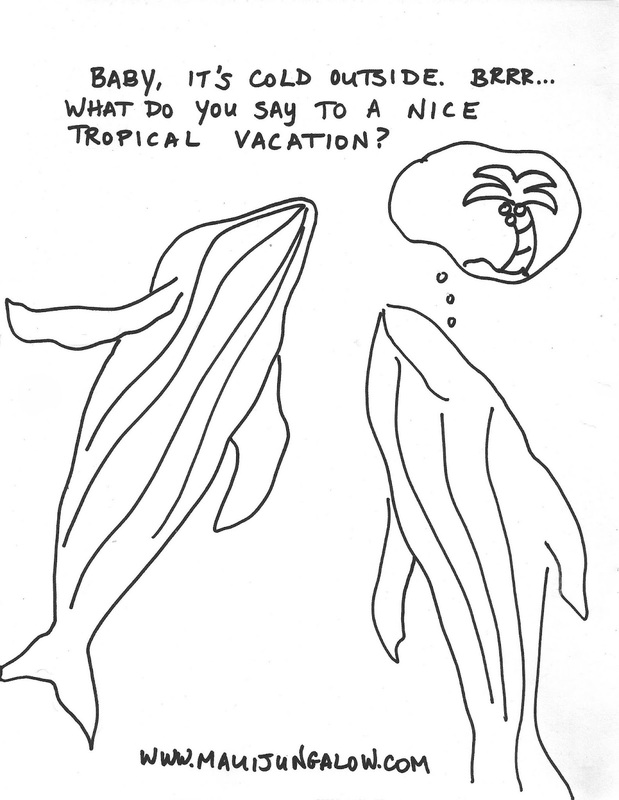 Use the same common sense you would anywhere else in the world, even if you’re on vacation. Again, most people in Hawaii are super nice, but you should still use common sense.